Looking for materials from the Clearing the Way for Community workshop held at 11th Month 2017 Interim Meeting? Click here to find it in the resources section of our Change Group page. And learn more about how your Meeting can take on Equity, Diversity, and Inclusion by perusing the rest of the page. Click to email about becoming a member of GLDC, STRIDE, or a Change Group in your local Meeting. Helpful resources for wherever you are. Want to Donate? Invest in Inclusion! Select a specific city or give to the program as a whole. Seeking, recognizing, and answering the Light in all people has always been a fundamental value of the Quaker faith. And with good reason. Creating a community of genuine equity, diversity, and inclusion increases our strength, vibrancy, creativity, integrity, perspective, intellect, and our ability to face the challenges of today and tomorrow. It is a crucial element of being in right relationship with Spirit. As human beings steeped in a society that is rife with contradictions and injustice, we also know that bringing our local meetings, our yearly meeting and ourselves into alignment with this value of equality takes deep self-reflection and dedicated work. That is why BYM is pleased to launch the Growing Diverse Leadership Initiative created with a grant from the Shoemaker Foundation. This initiative aims to bring innovation and vitality to local Meetings within the Baltimore Yearly Meeting of Friends in ways that will increase and sustain multicultural and intergenerational community in all facets of the spiritual life of meetings and thus serve to strengthen Baltimore Yearly Meeting and the Religious Society of Friends. 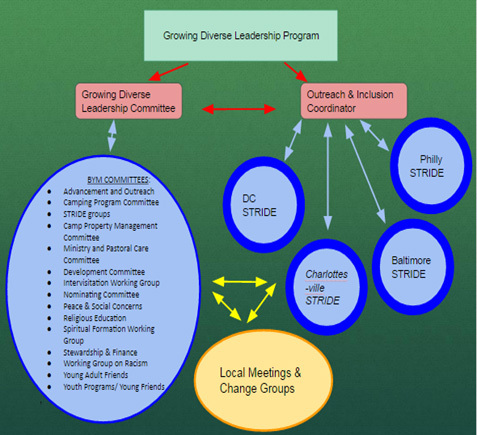 The Growing Diverse Leadership Initiative is comprised of several interlocking parts. The project was initially based on a model from the BYM’s camping program which is now known as STRIDE (Strengthening Transformative Relationships in Diverse Environments). STRIDE groups provide significant support to campers of color from neighboring cities to attend BYM camps. The program also provides equity training and consulting to camp staff. The STRIDE model focuses on relationship and leadership building, and on balancing practical action with individual and organizational self-reflection. The ad hoc Growing Diverse Leadership Committee (GDLC), with representatives from most standing committees of BYM, is responsible for translating the STRIDE ideology for use in the local and Yearly Meetings. In this first year, the GDLC’s main focus has been on the process of gathering baseline information through surveys, focus groups, and the Community Statistics Report, as well as by helping to form and support Change Groups within local Meetings and create resources for Campus Ministry projects. The newly funded Outreach and Inclusion Coordinator position, oversees the STRIDE program and serves as a resource to the GDLC. Check here for events related to the GDLI’s mission of promoting equity, diversity, and inclusion with regard to race, age (and the many intersectional identities that go with that) in the Quaker world and beyond. Add this calendar to your own Google calendar to be able to view or hide all events at your leisure. Email your event title, description, and organizer to post.